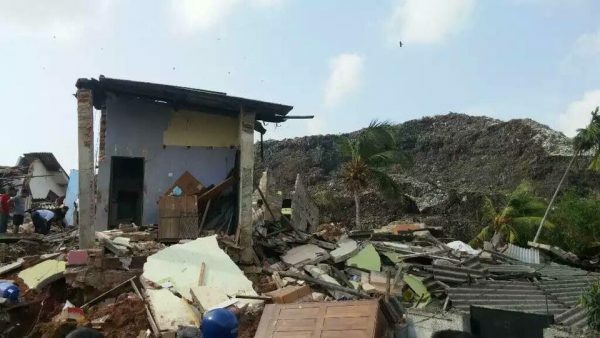 On the afternoon of 14 April tonnes of garbage at Meethotamulla, one of the biggest dumping sites just outside Colombo, came crashing down destroying scores of homes. At the time of writing, the death toll was reportedly 26 but was expected to rise. There have been serious allegations made by the affected community that rescue efforts did not even begin in earnest till very late into the night owing to a lack of direction and the failure of authorities. According to Nuwan Bopage, a lawyer representing residents of Meethotamulla, people were left using shovels to get to those buried. “During that whole time we could hear the dying breath of those buried under the garbage,” he said at a media conference the next day. Behind the tragedy is a litany of broken promises—including an assurance by the Prime Minister himself in 2015 of solving the problem within six months—and protests being met with tear gas or batons. A group of residents from Meethotamulla approached the Supreme Court in 2014 seeking to stop the dumping of garbage. According to some of the lawyers as recently as two weeks ago there were warnings of a collapse sounded in Court. But the protection of the right to equality offered in the Constitution lies buried today under tonnes of garbage. The judiciary, the bureaucracy, elected representatives as well as all of us have failed the people of Meethotamulla. Soaring almost 200 metres high and spread over a vast area, the Meethotamulla dump was a veritable death sentence for those who had no choice but to live in its ominous shadow. Labelling it a ‘disaster’ is misleading because it did not just happen, it was allowed to happen; the hazard of a garbage dump came to the community in Meethotamulla and not the other way round. Tragic as it is, Meethotamulla is a familiar story. Consider other ‘disasters’—Koslanda/Meeriyabedda in 2014, Kotmale in Nuwara Eliya in 2015 and Aranayake in Kegalle in 2016, followed by the floods in Colombo. In each of these cases, and there are others, it is the poor who have paid the ultimate price. Each of these cases underscores what development has meant for the estate, rural or urban working class poor. Their lives precarious, their legitimacy and citizenship extends only as far as the cheap labour and services they provide and the votes they cast. But unlike the other cases, Meethotamulla is quite literally the wasteland of Sri Lanka’s economic geography. The tragedy of Meethotamulla is that it is the outcome of planned development not its failure. And this is precisely also why just like no one was held accountable for the tragedies in Meeriyabedda or Aranayake, no one is likely to be held accountable for Meethotamulla either. In almost every case, from Meeriyabedda to Meethotamulla, the State claims people ignored warnings or defied calls to relocate. Or worse, simply holds the victims responsible, like blaming the floods in Colombo on those living on canal banks or floodplains. The planned and organised destruction of the environment in the name of development, which in fact exposes the poor to the highest risk, continues unabated. But what is implicated is also development itself not just its agents. Many people have asked why people were not relocated. But why should they have been? As people in Meethotamulla have long said, the problem is the garbage not them. The relocation reflex is actually symptomatic of the many prejudices and presumptions regarding the urban poor and their entitlements. That somehow their presence is more often than not risky, illegitimate and illegal, that places like Meethotamulla must be just ‘settlements’, informal and impermanent anyway. The previous Government showed so much alacrity in forcibly relocating thousands of Colombo’s poor into high rises at great economic and social cost. But with all its militarised might and efficiency it could not stop the dumping of garbage in Meethotamulla. If the then Government was out to make Colombo ‘slum-free’ and a ‘world-class city’, the present one has its eyes set on a ‘megapolis’ and a ‘smart city’. That Colombo has entrenched pockets of poverty, where the average lifespan and levels of health, income and consumption are far below what they should be matters little in these plans. None of these grandiose visions are grounded in equity, inclusion or spatial, social and economic justice, in securing the lives of those most at risk. The only kind of risk that is valued is that taken by real estate investors. As much as other factors, it is poverty and distance from power that turns hazards into disasters for some but not others. Meethotamulla, much like the floods, put paid to the assertions of the previous and current Government of taking measures to improve the lives of the urban poor. In fact, far from prioritising the improvement of habitats and housing conditions of those most at risk in Colombo, the focus has and continues to be on ‘liberating’ land that can be marketed as real estate, in the service of a financialised economy. If the Meethotamulla dump had been on anything that might become valuable real estate it would have been moved, like thousands of Colombo’s working class poor were. They were obstructing economic corridors that needed ‘liberating’, but living in the shadow of mountains of garbage was acceptable. The palpable sense of outrage and outpouring of support for the survivors from across Colombo and beyond is indeed welcome. But the forced evictions of thousands of Colombo’s poorer residents in the name of development evoked no such outrage or sympathy. The reality is that the poor have long been paying not enjoying the dividends of so-called development. If we can see Meethotamulla for many fundamental wrongs it exemplifies and begin to be outraged by them, we will have perhaps started towards ensuring so many lives are not lost in vain, yet again.